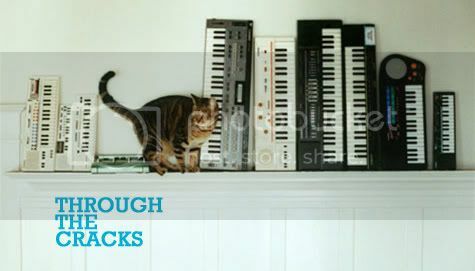 ‘Through the Cracks’ is dedicated to the albums by bands and artists that I missed or overlooked throughout this year. These are artists that once graced the pages of this blog and for that reason it would just be uncalled for that I not at least acknowledge them. Granted, some of them do put up some decent if not superb tunage, so taking a dip in their aural creations even at this late of the year proves to be worth the time spent. I personally didn’t expect to hear this much variation - from a band I’d thought I had my finger on - on just a single record. Feel Good Ghosts is Minnesota’s Cloud Cult’s sixth album to date. Essentially you’ll get the predictable aspects of the music genres, which include power pop and alt-folk but on the side, the record also comes equip with electronica, orchestral sweeps, and even a tune where you’ll find frontman’s, Craig Minowa’s warbles replaced for rapping verses instead. Cloud Cult takes you through a rather random course of songs all through the disc. You’ll often be left wondering whether you’re still listening to the same album you were listening to 15 minutes ago. Though this one cut doesn’t help at hinting of what to imagine from the whole record, it helps by making you intrigued enough to advance even further into the musical realms of Cloud Cult. Everything feels very comfortable and familiar in David Karsten Daniel’s latest release, Fear of Flying. If it wasn’t for the endearing whimsicality that had caught my attention in his earlier works, I would’ve treated the music of DKD similar to the rest of the kinfolk of male folk singer/songwriters: with plain disinterest. However on this album, the pacing is more deliberate and hushed; gone are the cathartic moments and idiosyncratic touches that dwelled on most of 2007’s Sharp Teeth. But in the end, the warmth, and ease, and spareness that fill up the corners of Fear of Flying makes this one compilation you’ll keep wanting to come back to. |mp3| David Karsten Daniels - That Knot Unties? It isn’t immediately obvious how captivating some of the songs in Earlimart’s new record, Hymn and Her can come across. Listeners who aren’t careful might find the songs too dreary or restrained, but at closer inspection most of these tunes carry impressive curvatures evocative of wistful 90s melancholic balladry. At the outset, I assumed that I was going to have to drag myself through the entire monotony of the record, but it turns out that Earlimart is a quietly wonderful band and the album is disarmingly beautiful. Of course to be completely honest, the band Moscow Olympics were never neglected by me. I always had it in mind to keep close attention to this dream pop troupe from the Phillipines, so their mini LP Cut the World have already received heavy rotations all year long and weeks on end! Moscow Olympics cast their melodic net into the sprawling waters of music that gushes with blissful, stripped down quality, evidently on Cut the World, where the band continues to crank out stunning pop sculptures that are nothing short of impressive. Jangly guitar tunes has never sounded this divine, I can you tell that.